The Phillies have a half-game lead over the Atlanta Braves in the National League East as they head into a four-game series against the visiting Miami Marlins. Nick Pivetta (6-9, 4.85 ERA) will face Pablo Lopez (2-2, 5.34) in a battle of right-handers during the 7:05 p.m. ET opener at Citizens Bank Park. Even with a stumble at the end of the month, the Phillies (59-48) went 15-11 in July. They snapped a four-game losing streak with a 3-1 win over the Boston Red Sox on Tuesday at Fenway Park. [post_ads]Prior to Tuesday's win, the Phillies made a pair of moves at the trade deadline, acquiring All-Star catcher Wilson Ramos from Tampa Bay and left-handed reliever Aaron Loup from Toronto. 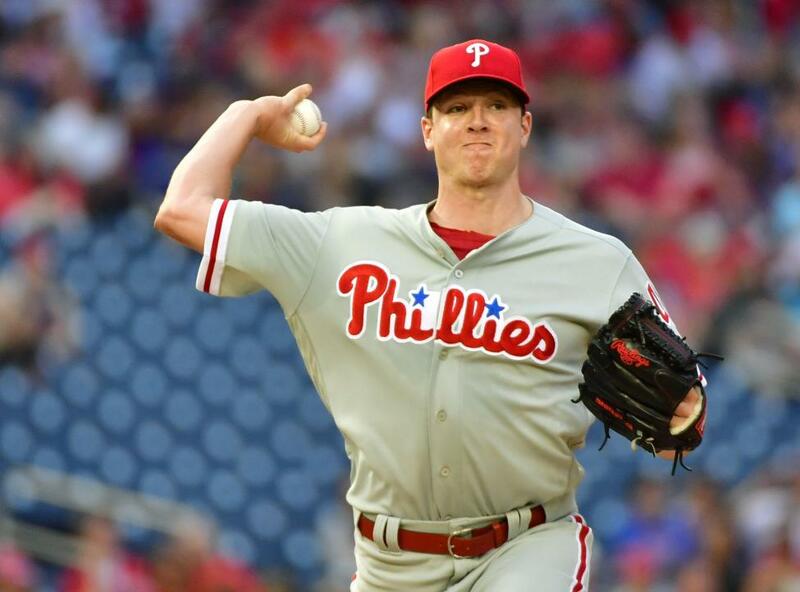 Ramos is on the disabled list with a hamstring injury, but Loup -- who has a 4.54 ERA and 10.6 K/9 rate in 50 games this season -- could make his Phillies debut on Thursday. Philadelphia also traded with the New York Mets for veteran infielder Asdrubal Cabrera last weekend. But the team's front office did not make a huge splash in the form of a starting pitcher or lineup-altering bat. "It's pretty cool of the front office to give us that vote of confidence," Phillies left fielder Rhys Hoskins told MLB.com after the deadline. "We're in first place. I think we're only going to get better. I think that all of the guys that are in here, if we continue to develop and get better like we hope to and expect to, you sprinkle in some of the guys like Ramos that has experience, we're going to be good. We're going to be exciting. The last couple months are going to be fun." Hoskins has been on fire since the All-Star break. The 25-year-old is hitting .327 with seven homers, six doubles, 14 RBIs and a 1.309 OPS in 12 games since the Midsummer Classic. The Phillies are hoping Hoskins can stay hot down the stretch as they try to capture their first playoff berth since 2011. Wins at home against teams like the Marlins could be crucial for their postseason chances. Philadelphia is only 4-5 against Miami this season. The Marlins (46-63), who had their Wednesday night game in Atlanta postponed due to rain, have won two of their three series against the Phillies this year, including a three-game set in mid-July. Lopez, 22, will be making his sixth career start and his first against the Phillies. He has pitched at least five innings in all of his outings. Lopez gave up nine hits and four runs in 5 2/3 frames against the Nationals last Friday. Pivetta, meanwhile, has had a tougher start to the second half. He's surrendered nine earned runs in two starts (11 1/3 innings) since the All-Star break. The second-year major leaguer had 12 strikeouts in his last start against the Cincinnati Reds, but he still allowed five runs on six hits in six innings. Pivetta is 2-1 with a 6.56 ERA and 1.457 WHIP in five career starts against Miami.